The Bethel Conservative Mennonite Church was organized in 1957 as a schism from the Riverdale Amish Mennonite Church, in which the bishop, Valentine Nafziger, took a more conservative position on nonconformity in attire and withdrew with a like-minded group. The membership in 1958 was 69, with Nafziger as bishop and Kenneth Brenneman as minister. The Bethel group built its own meetinghouse in 1958. In 2014 the ministerial team included Bishop Peter Shantz and Deacon Howard Lichty. Continuing loss of members finally led the congregation to close its doors in 2014. The building was taken over by the Milverton Conservative Mennonite Fellowship, a congregation that emerged from an earlier internal division. 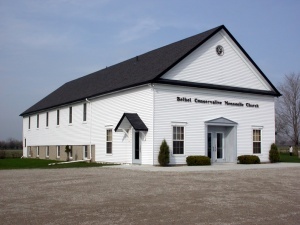 Milverton congregation took the name Bethel Conservative Mennonite Fellowship. Cressman, Kenneth. "The Development of the Conservative Mennonite Church of Ontario." 1976. Mennonite Archives of Ontario. Mennonite Church Directory 2014. Harrisonburg, VA: Christian Light Publications, Inc., 2014: 96. Gingerich, Orland, Marlene Epp and Sam Steiner. "Bethel Conservative Mennonite Church (Millbank, Ontario, Canada)." Global Anabaptist Mennonite Encyclopedia Online. October 2014. Web. 24 Apr 2019. http://gameo.org/index.php?title=Bethel_Conservative_Mennonite_Church_(Millbank,_Ontario,_Canada)&oldid=162403. Gingerich, Orland, Marlene Epp and Sam Steiner. (October 2014). Bethel Conservative Mennonite Church (Millbank, Ontario, Canada). Global Anabaptist Mennonite Encyclopedia Online. Retrieved 24 April 2019, from http://gameo.org/index.php?title=Bethel_Conservative_Mennonite_Church_(Millbank,_Ontario,_Canada)&oldid=162403. Adapted by permission of Herald Press, Harrisonburg, Virginia, from Mennonite Encyclopedia, Vol. 4, p. 1065. All rights reserved. This page was last modified on 8 November 2018, at 15:48.